BBQ Turkey Tips and Tricks – It's not hard! It's not hard – it's about trying it once and getting a grip on it. Here's a letter from one of our customers. Yes, it really is this easy! BBQ turkey -- no problem! Pick up a turkey and some smoke wood-chips. The most inexpensive poultry in the meat case, these days, even in the summertime. Don't be afraid of frozen birds, either. Fresh or frozen, they're both inspected by the USDA, and the quality is the same. By the time Thanksgiving rolls around, you'll be a total pro. Here's what you do. We chat with people all year long on line; we've been doing appearances for the Big Green Egg and various retailers lately – and the consensus of opinion is, "can't believe how easy that was!" Here's a couple of links to review. One of the best articles ever written on going vertical with turkey right in your roaster was what we think of as the "Michael Jordan" piece by Sam Gugino a few years ago in the San Jose Mercury News. A professional chef and author, Sam breaks it down step by step. You'll see – the best turkey you've ever had really is this easy! And then if you have some exotic or specialty birds, ducks, wild game birds, etc., call or email us. We'd be glad to send you special recipes we've collected over more than 30 years playing our vertical game! We've been cooking vertically with private game clubs all over the world for many years. So take the time, learn to play BBQ vertically – we'll help you. We have all the seasoning blends for you! So get a jump on it, and enjoy! You'll be glad you did. Have a great rest of the summer – have fun – and join the vertical BBQ club! President / Co-inventor of the Spanek Vertical Roasting products. 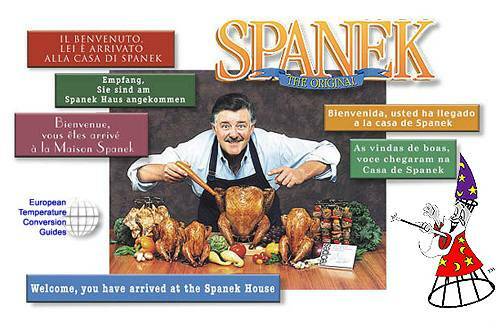 "Remember ... we are the Original Spanek Vertical Turkey Roaster™. :"